The above article featured in the Essex Enquirer Thursday 23 July 2009. Members of Leigh Road Baptist Church, Marguerite Drive & Pall Mall had fun as part of the Eden Projects Big Lunch that took part on Sunday 19th July 2009. Fairtrade samples were given out courtesy of The Co-operative. Thanks for your support. Leigh Road Baptist Church (LRBC), Marguerite Drive & Pall Mall, Leigh-on-Sea, Essex took part in the Eden Projects Big Lunch on 19th July from 12.30pm. Over 2 million people are expected to close their streets and share lunch with their neighbours. A great idea to turn streets back into neighbourhoods. 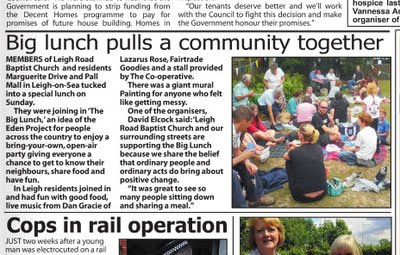 So we are LRBC, Marguerite Drive and Pall Mall in Leigh-on-Sea joined in and had fun with good food, live music from Dan Gracie of Lazarus Rose, Fairtrade Goodies & Stall provided by The Co-operative and Giant Mural Painting for anyone who felt like getting messy. Of course there was plenty of bunting to attract attention. A spot of rain for about 5 mins couldn't dampen our spirits either. Leigh Road Baptist Church, Marguerite Drive and Pall Mall in Leigh-on-Sea, made the of most of the hot weather and brought our neighbourhood together, by hosting a day to celebrate people, community and Fairtrade food at Big Lunch garden Party this past Sunday afternoon in the Leigh Road Baptist Church Garden. It was one of many street parties across the UK on Sunday 19 July. And we believe 7 in Southend-on-Sea. An Eden Project initiative with millions of events planned around the country, The Big Lunch is designed to bring about Human Warming – the glow that comes from simple acts of sharing and celebrating what it is to be human. For more information visit www.thebiglunch.com and for more info on Leigh and Southend's Fairtrade Campaign visit www.fairtradeleigh.org.uk and get involved.